In the late 1940's a young aero-modeller named Ron Cowl who fed up with ‘bending’ model aeroplanes took to model boat building as an alternative. He and a few other used to frequent Rowntree Park Lake. 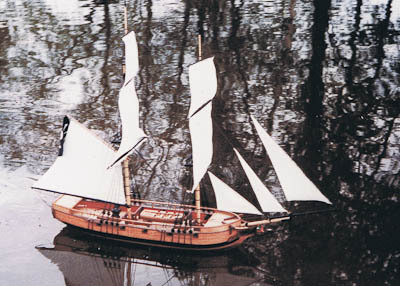 A man from Hull road who built models for the shipyard’s showrooms sailed a steam powered four funneled model liner, and a few others were interested in model yachting. In 1951 Ron and new friend Arnold Parker seemed to be the only two sailing, mostly primitive electric but they had two diesel engined hydroplanes on the lake, something that would not even be considered today! In 1955 on Ron’s return from the forces he contacted past associates with a mention in The Yorkshire Evening Press and by 1956 this formed into The York Ship and Ship Model Society with a grand total of four members. Time and situations changed however and the newly formed club motto of ‘APATHY’ soon became apparent and contacts were lost. In 1973 Ron Cowl started all over again to organise the group. Meetings were held on the fourth wednesday each month at the Longboat Bar in the Viking Hotel, and notices of the foundation of the York Club were put in the magazines of ‘Model Boats’, ‘Model Shipwright’, ‘Sea Breezes’ and Ships and Ship Models. More members joined at this time, John Williamson, Bob Allison, David Stephenson (to mention a few from the present) and Mike Nisbet (deceased). The group worked on a very casual basis, Ron doing any ‘secretarial’ work and Bob liaised with the City Council re events in the park. Modelling was still mainly Static and Vince Brown was a leading light turning out many plank on frame Nelsonian models. The club welcomed all kinds of modelling and meetings were the place to bring models and exchange plans, materials and ideas. (an idea that today has sadly laxed). In 1975 the Deputy Burser at York University gave permission to use the their lake for regular sailings. Once the matter of club fees and a suggestion of having a chairman and secretary was raised- but this brought a definite No! - and the idea of a half crown fee would have perhaps closed the club. Due to increased tourist trade at the Viking Hotel the club moved to the Lendal Bridge Inn and in the small front room one meeting once managed as many as thirty one members. A few years later when this changed to a theme pub we were mooted to The Brigadier Gerard with more space and parking. Allan Birkin (deceased) a very keen railway and boat modeller joined at this time, and the modelling interests of the club changed from static to sailing models, moving Bob Allison to change the name to ‘The York Model Boat Club’. About 1999 Allan & Ron were in the model shop in Leeds when Don (deceased) came in and was asking staff if they knew where he could find the York model boaters? “we are standing right behind you” came the answer. Don became the Chairman and Allan soon volunteered for the arduous post of secretary. On a final note: “The York Ship & Ship Model Society” has always continued to exist, it is a key which does open many doors in Ron’s lifelong shipping and correspondence hobby.